Thousands of farm animals have suffered in more than 700 serious breaches of welfare rules in Scotland in less than two years, according to official inspection reports. Cattle, sheep, pigs and chickens have been found injured, ­emaciated, diseased or dead on arrival at abattoirs. Numerous animals were slaughtered while heavily ­pregnant or had to be repeatedly stunned before they were killed. There was “cannibalism” among chickens, “unnecessary pain” endured by cattle and “massive bruising” on sheep. In other cases there were “signs of suffering”, “evident stress” and “extensive maggot infestation”. Investigative website The Ferret joined with the Bureau of Investigative Journalism to ­catalogue the cruelty. Peter Stevenson, chief policy adviser of ­Compassion in World Farming, called on the Scottish Government to call a meeting of enforcement bodies “to develop a strategy to achieve hugely improved enforcement of the legislation on welfare on-farm and during transport and slaughter”. The Scottish Government’s watchdog agency, Food Standards Scotland (FSS), log welfare breaches found by inspectors at 35 ­operational ­abattoirs. They released figures under freedom of information law recording 706 incidents between May 2015 and January this year, many involving multiple animals. 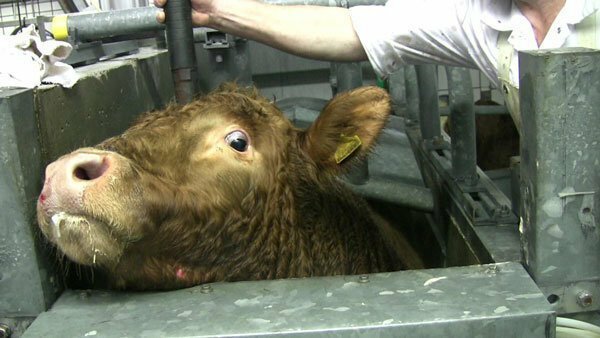 More than a third – 257 – were “critical non-compliances”, meaning they posed “a serious and imminent risk to animal welfare” or caused “avoidable pain, distress or suffering”. A majority of the overall figure involved cattle. There were also 86 breaches recorded with sheep, 77 with poultry and 63 with pigs. A third were blamed on poor conditions during transport. A further 237 were attributed to inadequate welfare on farms. According to the FSS log, there were 130 incidents in which animals were killed in the latter stages of pregnancy. In 100 instances, animals were found with bruising, broken legs or other injuries, and in 92 cases they were in poor health, weak or thin. There were 45 incidents in which stunning of the animals before killing them was deemed inadequate or ineffective or where procedures were found to be deficient. In one instance last September, a cow was stunned six times before it lost consciousness. Most incidents led to trading standards or animal health offices being passed information. NOTE: April 5, 2017 Canada's Federal animal slaughter regulations will be replaced by the Safe Food for Canadians Regulations. The public has until April 21st to provide feedback. As well as sending an e-mail to Dr. Richard Arsenault, we copied it to CFIA President, Paul Glover, and Health Minister, Jane Philpott. The CFIA, in conjunction with Health Canada is responsible for food safety. Mercy for Animals has also created a petition you can sign. It is vital that we speak up for the animals. Sadly, the law allows for an incredible amount of animal suffering if it is profitable, and government continues to subsidize such cruelty. Comment: Industrial farming is responsible for more pain & misery than all the wars of history put together. Tens of billions of sentient beings, each with complex & emotions, live & die on a production line. The march of human progress is strewn with dead animals. Be sure to visit all our other pages for information, news, action alerts, legislation & more!